Other Info: 6.0" by 9.0", 320 pages, Hardbound, lb item wt. 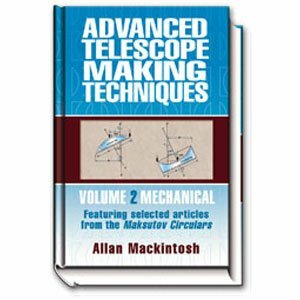 Advanced Teleescope Making Techniques Featuring Selected Articles from the Maksutov Circulars is based upon The Massutov Circulars which were edited over a period of 21 years by Allan Mackintosh and distributed to Maksutov Club members. The club was originally organized to make a mass purchase of custom molded Maksutov corrector blanks but it soon became apparent that a newsletter was needed to share information on optics and practical glass working to close tolerances. Ultimately, nearly 200 editions of the Circulars were distributed to members. From this mass of material two 300+ page books have emerged (1st Vol not included click here to purchase) which describe a wide range of subjects of interest to the person who has made a telescope and wants to learn more about this fascinating hobby.